As far back as 1915, the folks at Universal Studios in Hollywood were already thinking of bringing audiences closer to its movies. 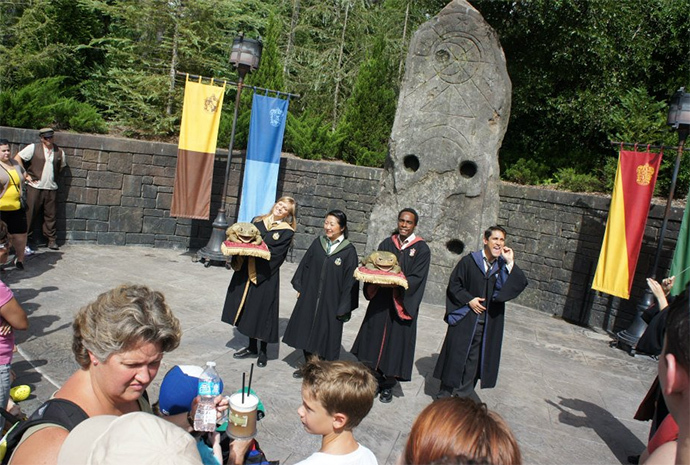 It opened its doors at Universal City to the public at a small fee and offered studio tours, sharing with them a slice of movie magic. Several unfortunate fires, changes in management and some expansions later, it opened its first theme park in 1964. Today, this foresight in uniting movies and theme park attractions has evolved into four Universal Studios (two in the US, one in Japan and one in Singapore), with one more in the pipeline. In this second instalment of a three-part series on movies-inspired theme park attractions, we look at popular movies-inspired attractions at Universal Studios, and another movie studio hoping to share a piece of theme park action- the 20th Century Fox World in Malaysia. The park attractions at all Universal Studios are themed to movies, with a cleverly coined tagline, “Ride the Movies”. 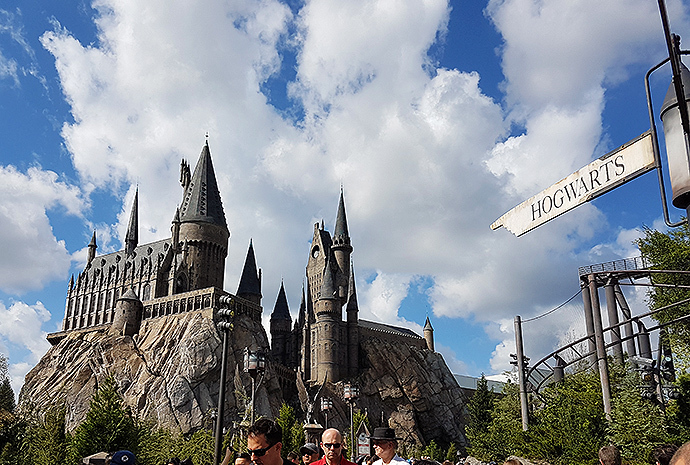 The attractions usually stand on their own or are clustered into zones, and it took the popular Harry Potter franchise to inspire Universal Park and Resorts to develop an entire themed zone dedicated to it, giving birth to the Wizarding World of Harry Potter. 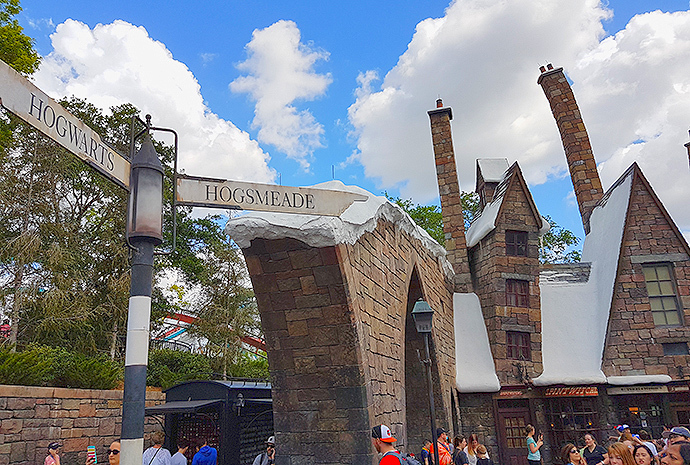 Opened in 2010 at Universal’s Islands of Adventure in Florida, the Wizarding World of Harry Potter changed the theme park landscape, giving rise to the term “Blockbuster Worlds”. Soon, Cars Land appeared at Disney’s California Adventure Park, Toys Story Land sprung up in Hong Kong Disneyland Resort and most recently, Pandora- The World of Avatar opened in Disney’s Magic Kingdom in Orlando. (For more on Disney’s movies-inspired attractions, look out for our third instalment). 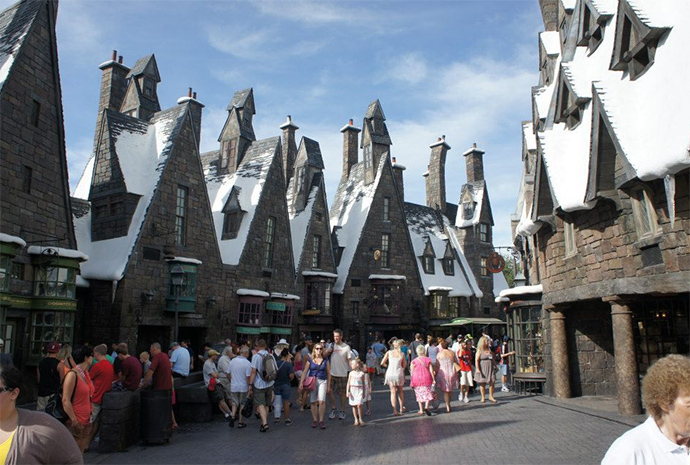 What made the Wizarding World of Harry Potter such a hit is how immersive the world is. 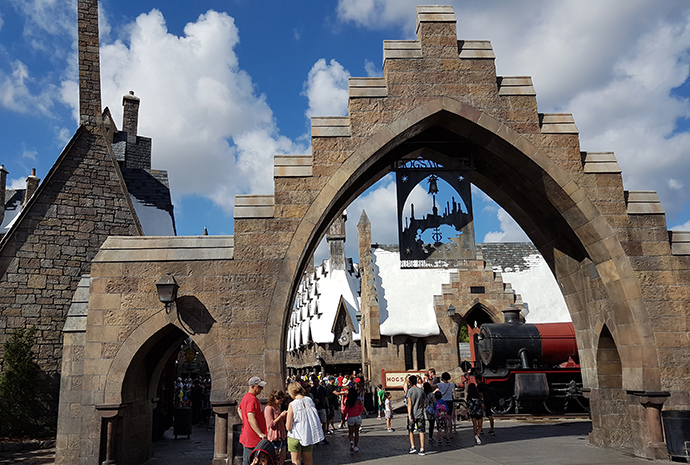 Seeing the gates to the Hogsmeade Village is enough to send any half-hearted Harry Potter fan into wild heart palpitations. Once you enter, you are greeted by the Hogwarts Express to your right. 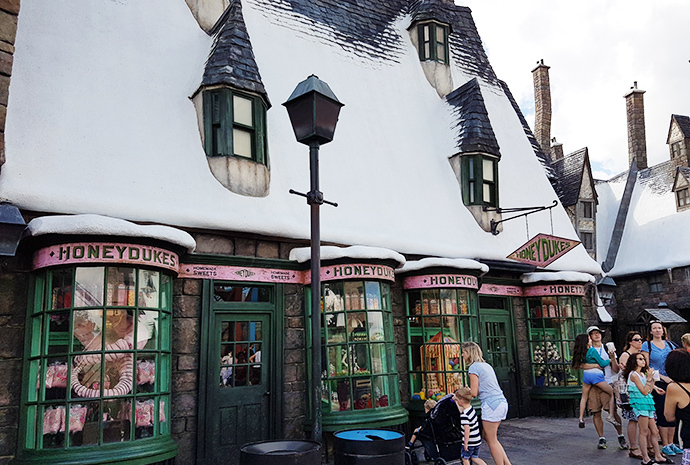 And just ahead is the picturesque medieval Hogsmeade village, with their rooftops covered with a thin layer of snow (Hogsmeade is always snowing in the Harry Potter movies). The thatched houses in the village aren’t just for show, they are heavily themed functioning retail and F&B, selling candies, merchandise and of course, wands. 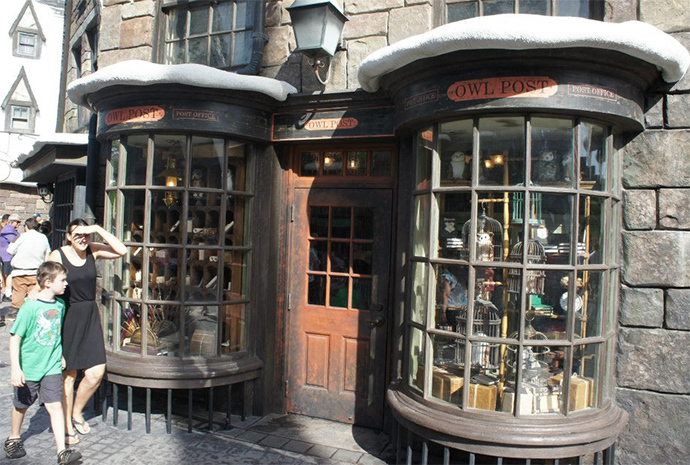 In fact, the Ollivanders wand shop in Hogsmeade has a permanent line of people wanting to take home a piece of Harry Potter. 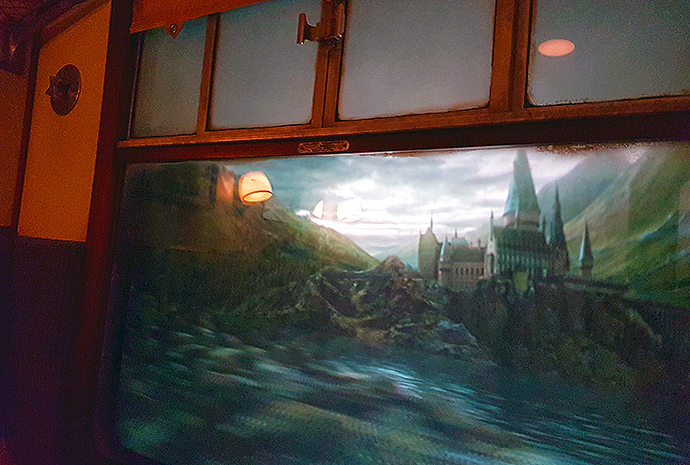 What makes it unique is its interactivity, the wand keeper will test a variety of wands with the guest until the right wand is found, with effects like thunderstorm erupting in the shop to add a level of realism. 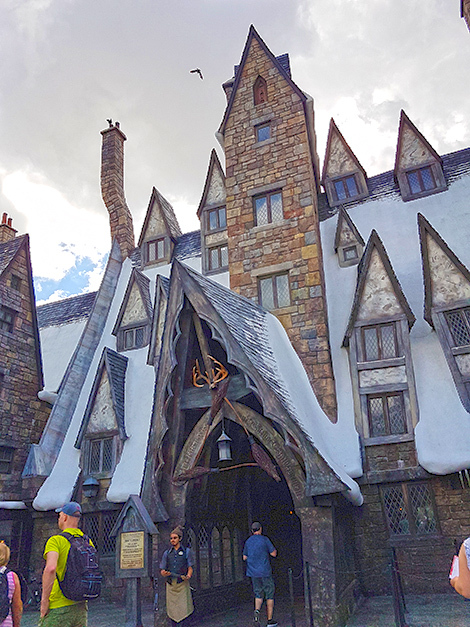 You can also find the Three Broomsticks, based on the inn and pub from the Harry Potter movies, offering a variety of food and beverage items from the Harry Potter universe, including the popular Butterbeer (You can’t leave here without tasting Butterbeer) and more. The theming game is so strong here, even the washrooms are themed. Don’t be surprised to hear moaning sounds coming from the walls when you go about your business. It’s just Moaning Myrtle being her usual self. 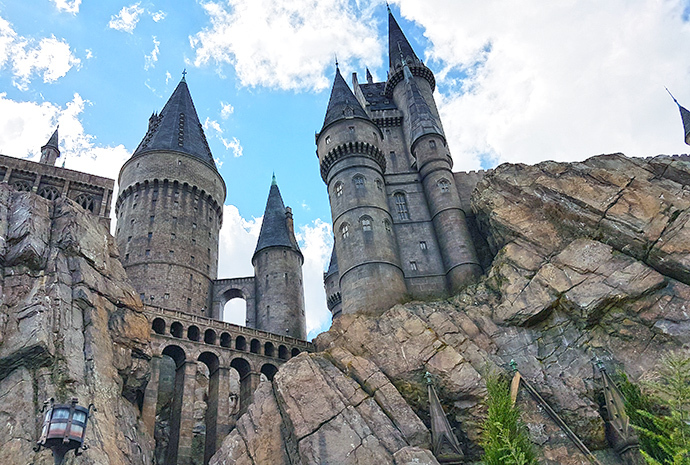 The highlight here is Harry Potter and the Forbidden Journey, housed in an impressive replica of the Hogwarts Castle. 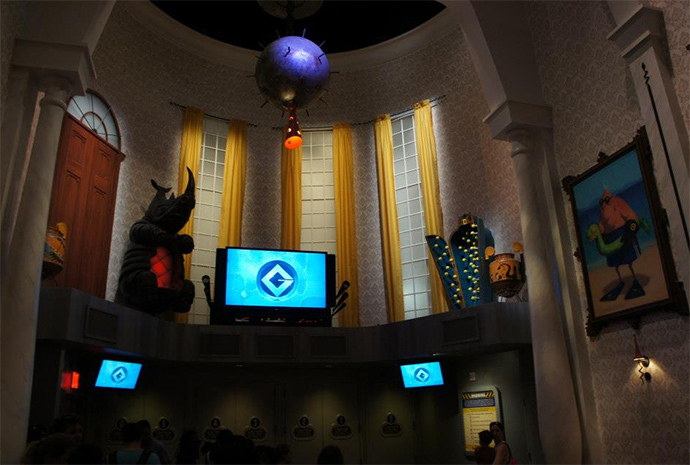 Visitors walk through the heavily themed castle to reach the ride, a motion simulator that takes you through various important parts of the castle, like Dumbledore’s room and the Gryffindor™ common room, before flying outside of Hogwarts where you’ll encounter giant spiders, the dementors, the Hungarian Horntail Dragon, and even pass through a Quidditch match. 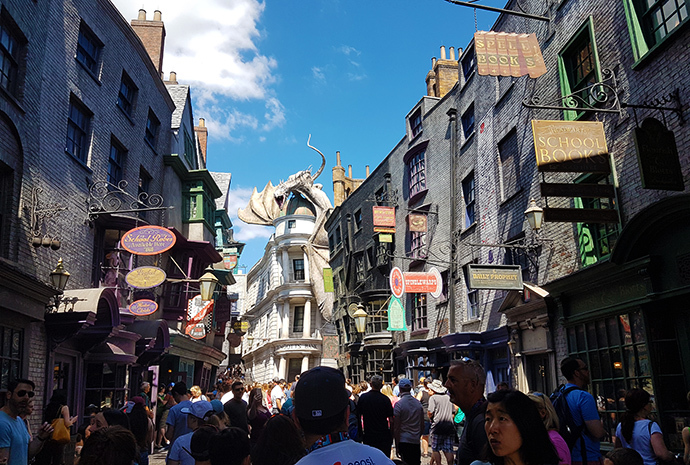 The success of this Harry Potter world led to its expansion, with Diagon Alley opening to the public in 2014 at Universal Studios Florida. 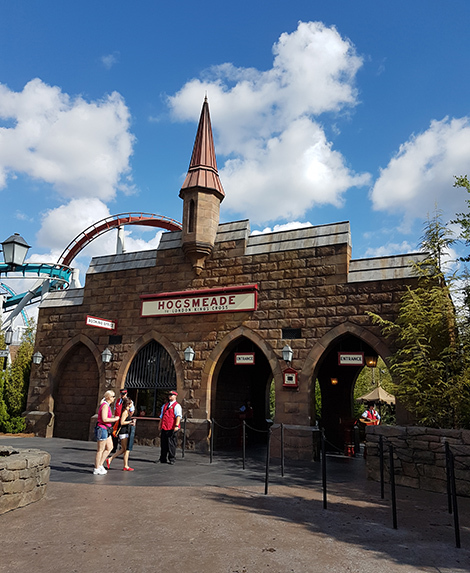 Also part of the Wizarding World of Harry Potter, Diagon Alley is connected to Hogsmeade via the Hogwarts Express, which visitors can hop on to travel between these two areas (and the two parks). 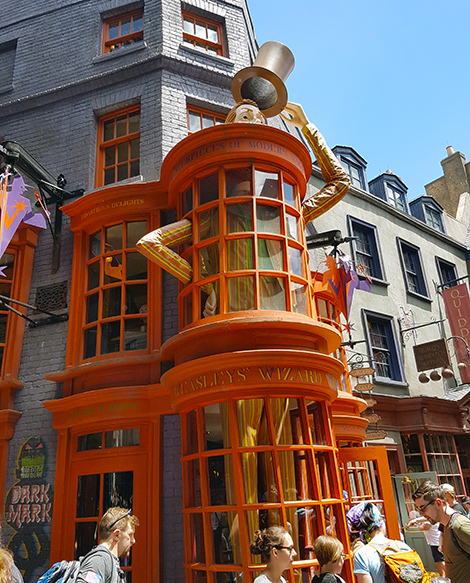 Diagon Alley, similar to Hogsmeade, is incredibly themed and looks like it is lifted from the movie. There’s a Fountain of Fair Fortune and The Tale of Three Brothers, puppet shows enacted from The Tales of Beedle the Bard. 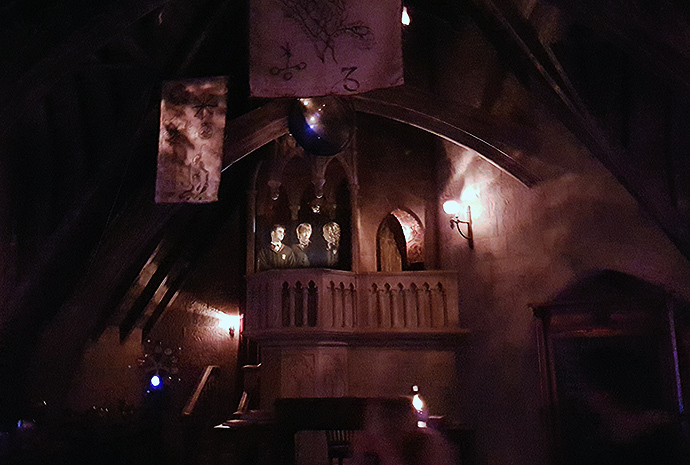 At the Gringots Money Exchange, you can “exchange” American dollars for Wizarding Bank notes. 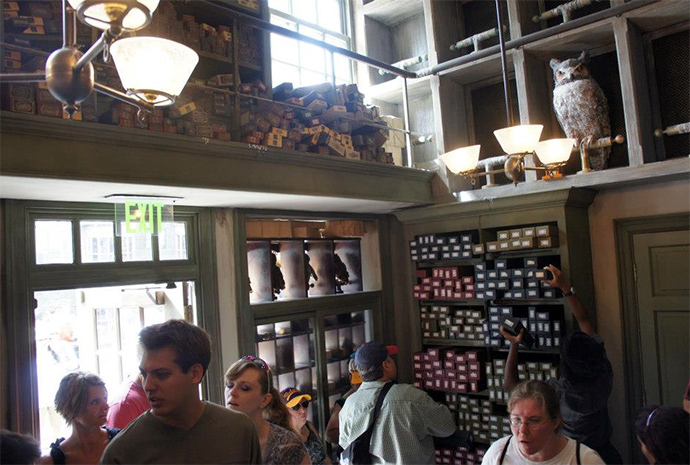 There’s also an Ollivander's Wand Shop here, which is always crowded as well. 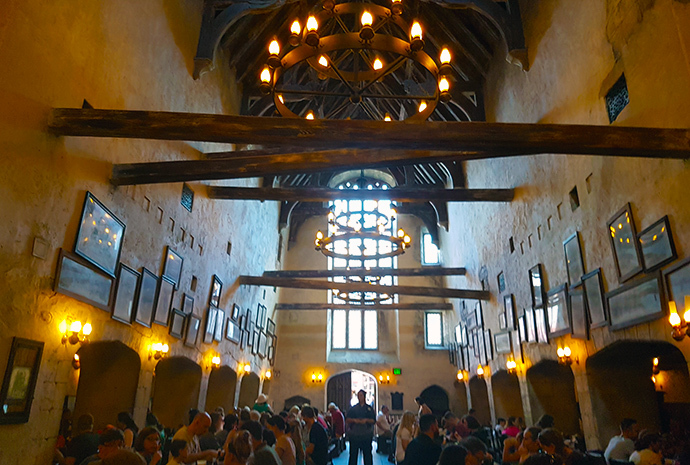 There’s the Leaky Couldron, where in the movie, is an inn and pub and serves as the entrance to Diagon Alley but here, it’s a restaurant. 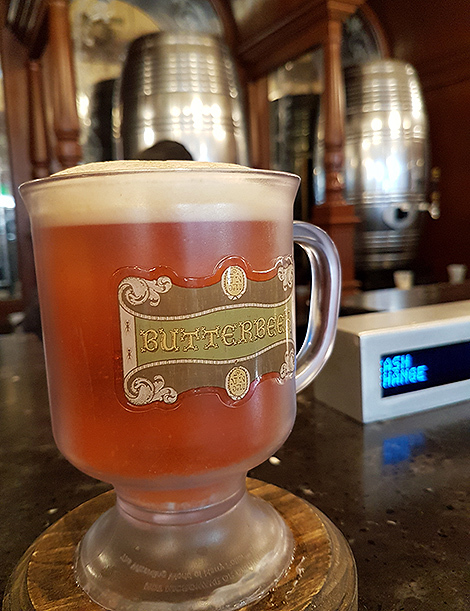 Over at the corner, the Florean Fortescue's Ice Cream Parlour serves up Butterbeer-flavoured ice cream. Everywhere you turn, you are deeply entrenched in the Harry Potter world. 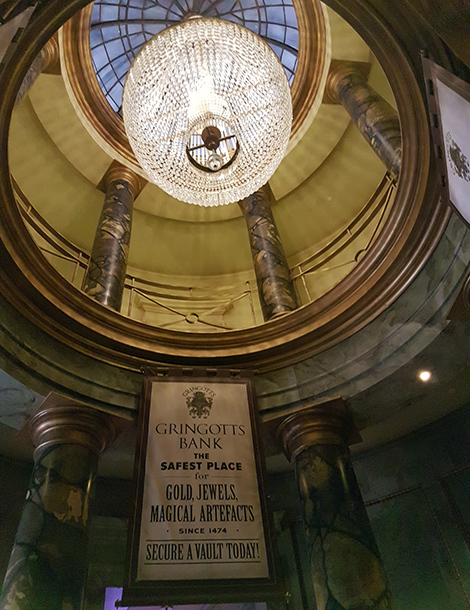 The crowning glory of Diagon Alley is Harry Potter and Escape from Gringots Ride, a 3D motion-based steel roller coaster dark ride that spirals around the Gringots Bank in Diagon Alley. 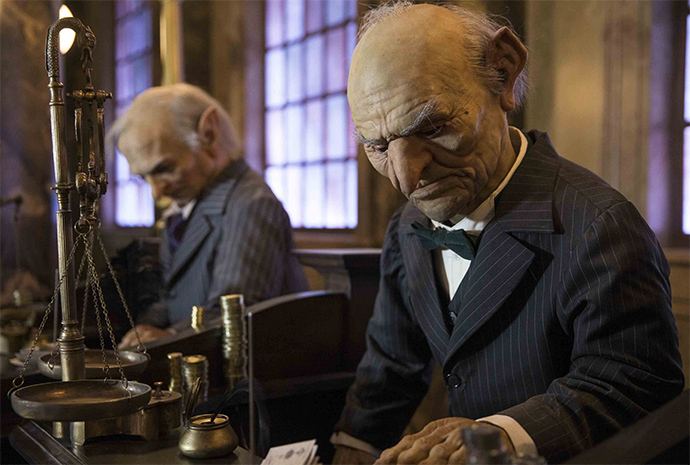 Guests enter the Gringots bank, under the watchful eyes of the goblins at their work stations all in their animatronics brilliance, and get into the queue line. You then travel through the depths of the bank to get to the ride. 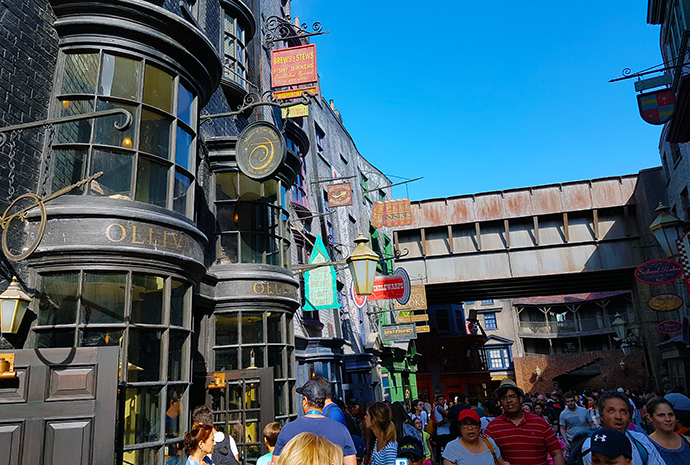 It’s not an understatement to say that it can take half a day just to explore Diagon Alley. 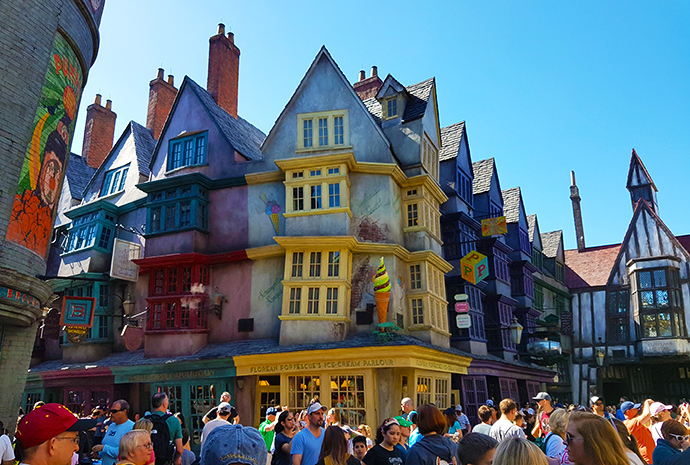 While Universal Studios Hollywood and Japan both feature the Wizarding World of Harry Potter, they only house Hogsmeade and Hogwarts, but not Diagon Alley. 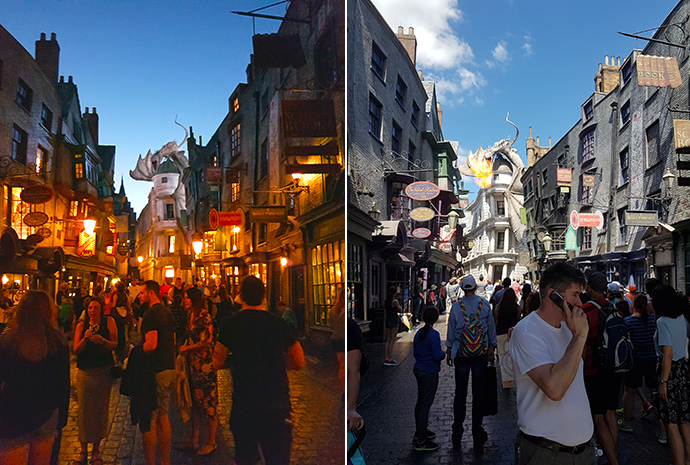 Tip: Both Hogsmeade and Diagon Alley look different between day and night. 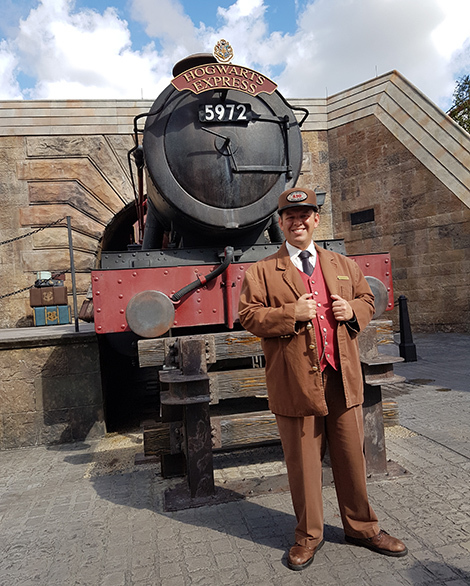 To truly enjoy an immersive Harry Potter experience, visit them at both times. When twilight dawns upon Hogsmeade, a pale blue glow blanket the rooftops of the houses and its colourful shops are illuminated, it’s like a magical spell is cast over the village. Over at Diagon Alley, it has that same enchanted atmosphere. 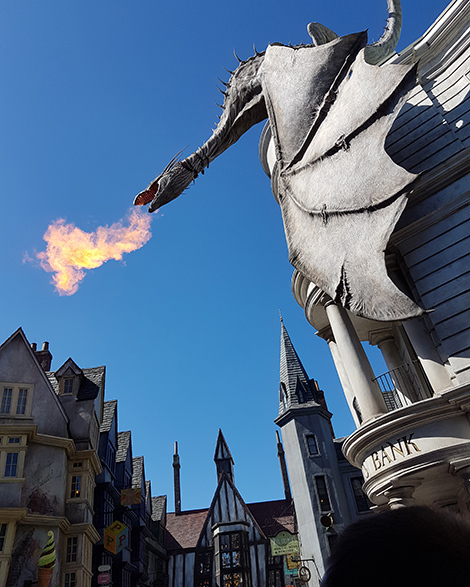 Plus, seeing the Dragon that hangs over Gringots breathing fire into the night will leave you in amazement. Opened in 2011 in Universal Studios Singapore, the 3D simulation ride is modelled after the Amazing Adventures of Spiderman and pits the Autobots against the Decepticons. 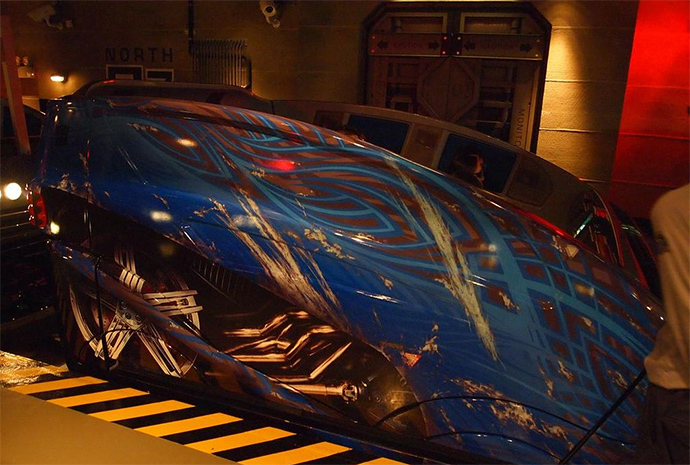 Guests are introduced to a new Autobot just for the ride- Evac. The ride has a storyline, which is told through pre-show briefings at the queue line. General Morshower explains that the Decepticons have descended on earth to locate the AllSpark and Optimus Prime introduces Evac, whom the guests-turned-recruits have to work with to bring the AllSpark to safety. 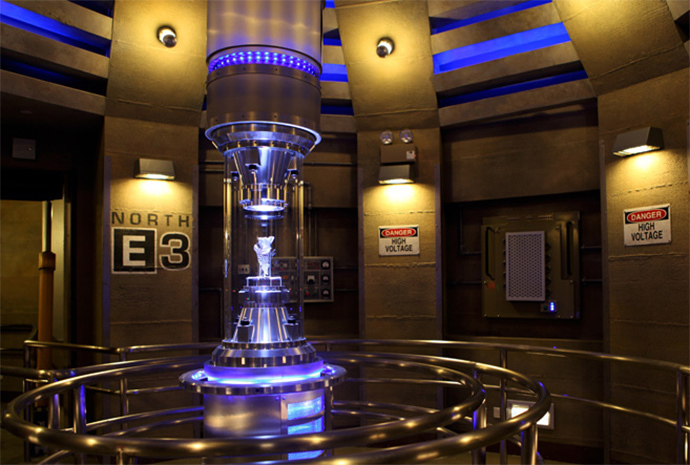 The long queue lines are themed to look like the NEST (Nonbiological Extraterrestrial Species Treaty) base, and there is even an AllSpark on display. 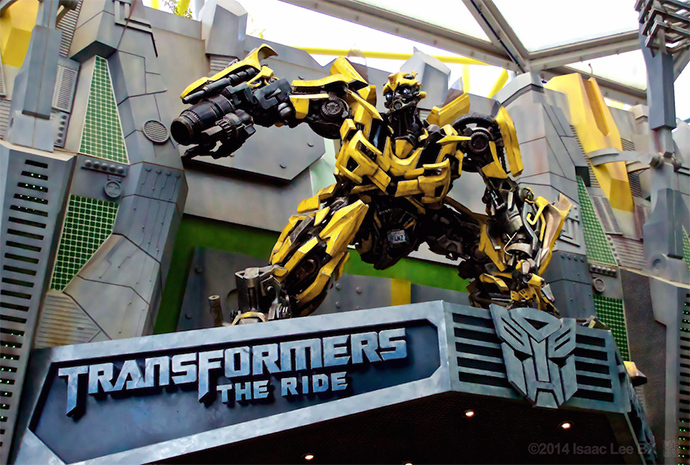 The ride lasts 5 minutes, and guests are brought on quite a journey, battling Decepticons and putting themselves in all sorts of perilous situations, like dangling at the side of a building, hurtling through an office building and almost burnt by fire (you can even feel the heat). Michael Bay served as Creative Consultant for the ride, and some ride scenes were actually footage taken from his Transformers movies. The attraction is also available in Universal Studios Hollywood (opened in May 2012), and Universal Studios Florida in May 2013. Tip: The ride is a 12-seater vehicle (in four rows), and you get different experiences between sitting at the front and at the back row. The front brings you closer to all that exciting 3D action, but the back row offers a more all-rounded experience, with a wider view of the scenes in front of you. Not Really. As long as you know the basics- Decepticons are bad, Autobots are good, you’re good to go. The pre-show introduces you to the ride and gives you a pretty clear picture, so you don’t have to catch the movies to enjoy the ride. A 4D computer-animated simulator ride attraction at Universal Studios Florida (opened in 2012), Universal Studios Hollywood (opened in 2014) and upcoming in Universal Studios Japan, the ride is based on the soaring popularity of the Despicable Me and Minions movie Franchise. Guests are basically being recruited as Minions. The queue line, which is at Gru’s house, has an introduction to central characters like Gru, Dr. Nefario, Margo, Edith, Agnes and the Minions, and there’re also scenes shown from the first film. Then after the pre-show, where Gru, Margo, Edith, and Agnes, welcome the guests, there’s a second pre-show that takes place in Gru’s lab. 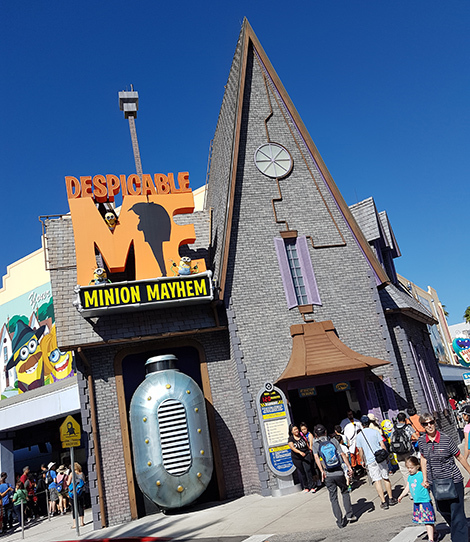 After specific instructions, the guests will enter Minion training, where you’ll climb onto a vehicle designed by Gru and be the best Minion you can be. The simulator ride takes place in a giant room with a massive dome screen and hyper-realistic projection system, you’d be thrusted up and down while flying pass buildings and dodging objects. Tip: When travelling with kids, steer them to the ride first before letting them see the merchandise shop. Otherwise, they’ll never want to leave, and no one gets to ride! Of course. How could you not have seen at least one Despicable Me movie by now? It’s literally like you’ve landed on Kong territory. 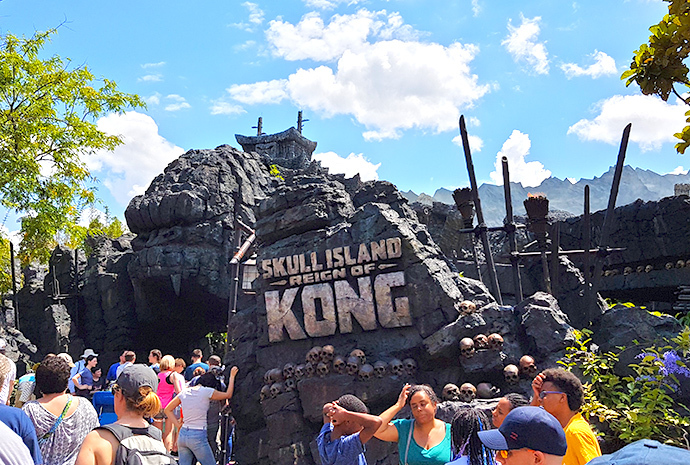 Launched in mid-2016, Skull Island: Reign of Kong is a 3D trackless dark ride. Guests enter these ominous gates filled with skulls and a giant Kong Kong sculpture at the top to begin a journey on a mysterious island. You’ll enter a temple themed to the natives of the island, encountering rituals and dead bodies to reach the base camp to embark on your jungle expedition. The action you encounter is actually happening on giant screens lined up on both sides of your track route. The expedition has you coming face to face with numerous creatures of the jungle, and one of your fellow expedition members is even captured by Terapusmordaxs, and eventually snatched by giant scorpions. You’ll even come across a face-off between Kong and dinosaurs, and have to escape from a group of dinosaurs hot on your tail. Tip: Because there’s action on both sides of the truck ride, you might find yourself whipping your head between left and right rapidly, trying to capture as much as possible. This might lead to you missing some action, or catching no action at all. You might want to take the ride twice, each one focused on one side, so you drink in all the bumpy action. Not at all, while the ride is themed after Kong, it doesn’t follow any movie storyline and seems to be an independent ride on its own. 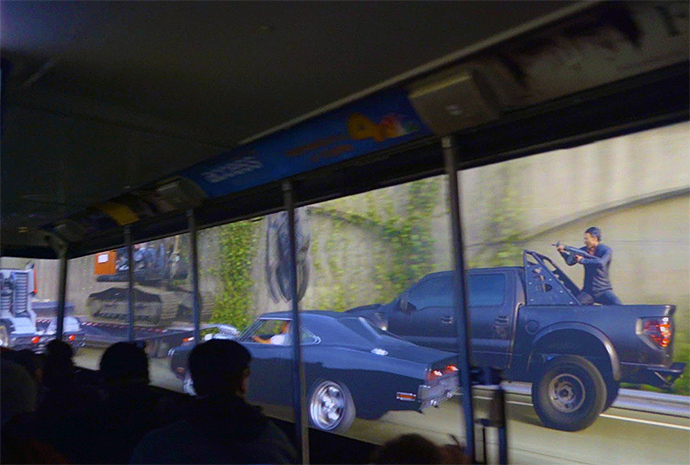 Based on The Fast and the Furious movie franchise, the attraction was launched in Universal Studios Hollywood in mid-2015. It isn’t a ride but part of the backlot Studio tour. The tour tram passes through Wisteria Lane (from the TV series Desperate Housewives) and makes its way to the next destination, but gets abruptly interrupted by Luke Hobbs (aka Dwayne Johnson, on the video screen aboard the tram ride) about getting the guests to safety, because Owen Shaw (Luke Evans) and his gang are after a witness of the tram. Before you know it, you’re in the middle of an exhilarating high-speed chase on the freeway. The attraction is also slated for a 2018 opening at Universal Studios Orlando. Tip: Most of the action happens on the right side of the tram side, so try and get a seat near the right! Definitely, otherwise, you have no idea who’s Luke Hobbs, Owen Shaw or Dominic Toretto, and all the story-line happening on the video screen might be totally lost on you. 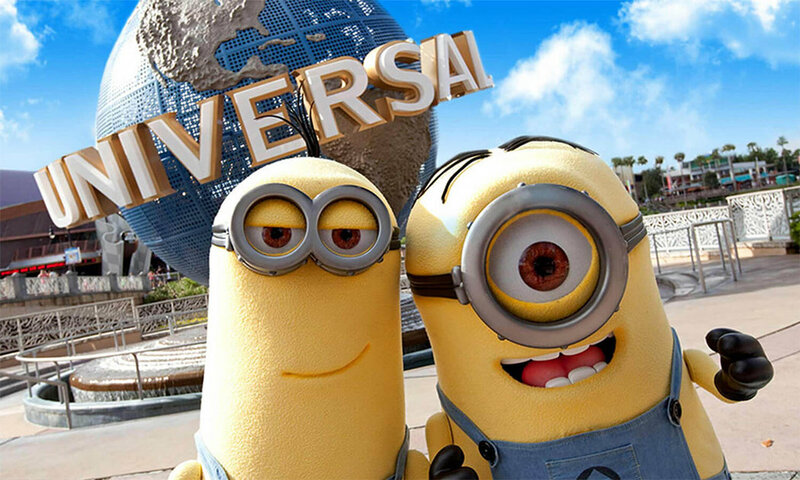 What’s next for Universal Studios? Next up for Universal Studios is Universal Studios Beijing, targeted to open in 2020. Some attractions set to appear here include Jurassic Park, King Kong, Despicable Me, Shrek, Madagascar, The Mummy, Waterworld, and The Fast and the Furious, as well as third party properties such as Harry Potter, Transformers, Men in Black, The Simpsons, Sesame Street, Peanuts, and more. What’s happening at 20th Century Fox World? 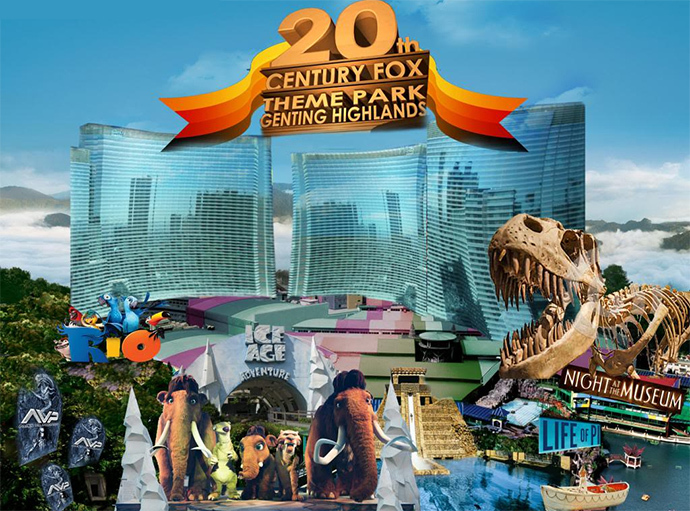 It was announced in 2013 that 20th Century Fox would enter the theme park business with a 20th Century Fox World opening at Malaysia’s Genting Highlands resort in 2017. The project has been delayed time and again and is now projected to open in late 2018. 25 acres in size and featuring around 25 rides, guests can expect attractions and rides based on popular movie franchises like Rio, Ice Age, Life of Pi, Night at the Museum, Planet of the Apes, Alien vs. Predator and Titanic. A healthy mix of kid-friendly and thrill rides, we can’t wait for it to open its doors.